Trion:Z - I feel good! I love my new Trion:Z it's fantastic. Everyone's talking about them. They look good and make you feel good - the Trion:Z is helping me focus and keep on track with my running training programme. 8 miles last Saturday morning in the snow. Will this help me achieve a personal best at the Bath Half Marathon in March 2011. I hope so! It seems that Trion:Z is the must have piece of equipment for all sports stars. James Anderson, Stuart Broad from the England cricket team were seen wearing them. These new Trion:Z products, pronounced Tri-on-Zee, use magnetic and ionic technology and users have reported that they aid with focus, energy, improve, fatigue and injury recovery. They have taken the cricket and sports world by storm! Trion:Z star, James Anderson is a believer in the product and reports how it helps him cope with the long training sessions. Trion:Z, developed in Japan as a performance and lifestyle product over 10 years ago has gone from strength to strength in the health and lifestyle market. Trion:Z launched its award winning range of products in 1997 and is now a leader in providing magnetic ionic gear to the global health and fitness arena, with a presence in over 60 countries worldwide. With Trion:Z’s negative ion releasing Mineon Health Fibres and capsules, negative ions are released at rates of 50-100 times greater than competing products and the patented magnetic technology ensures that the magnetic flow remains constant, making it one of the most technologically advanced product on the market. I have been told so many times over the last few months 'YOUR BLOG NEEDS UPDATING'. The reason I haven't is because I had another priority. Getting ready for the Swindon Half Marathon http://www.swindonhalfmarathon.co.uk/ - one of the most gruelling in the country. I have now completed that race and running has become an integral part of my life rather than a huge challenge. Pictures to prove it. My Blog will be updated regularly from now on. For all those that are interested! Make-A-Wish Foundation® UK hosted its 12th annual Summer Ball at the spectacular Blenheim Palace, Oxfordshire, on Saturday 12 June 2010, fundraising to grant magical wishes to children fighting life-threatening illnesses. A didn't we all have such a great time. More than 300 guests attended, including EastEnders actress Kara Tointon, actor Robert Powell, CBeebies’ Mr Tumble Justin Fletcher MBE, Secret Millionaire Caroline Marsh and winner of The Apprentice Michelle Dewberry. Eleven year old wish child Oliver Uglow from Southampton, who was granted his wish by the charity to go to Disney World Florida while battling Acute Myeloid Leukaemia last year, also attended with his family. Guests were treated to a champagne reception in the Great Hall with its hand-painted murals and intricate tapestries before dinner was served in a special marquee in the palace grounds. 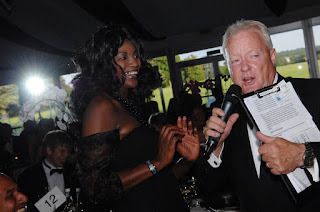 Each year a celebrity supporter hosts the ball – warming up the crowd and recounting tales from just some of the wishes the charity grants annually to hundreds of deserving children. This year it was television presenter and Patron of Make-A-Wish, Keith "Cheggers" Chegwin. Singer Dionne Bloomfield (god-daughter of Amy Winehouse) opened the evening and was followed later in the evening by the sensational Siren Strings Quartet. After dinner an auction was held, in which bidders could bid for meets with celebrities, signed memorabilia and holidays of a lifetime. During the bidding, the dragons from BBC’s Dragon’s Den, Duncan Bannatyne, James Cann, Peter Jones and Deborah Meaden beamed in via video link to tell guests to dig deep in their pockets. Guests then danced the night away with a special performance by the legendary Bill Wyman and his Rhythm Kings. There are currently 20,000 children living in the UK with a life-threatening illness and Make-A-Wish believes that every one of these children deserves to experience the magic of a wish. Make-A-Wish expects to grant over 700 wishes this year, rising to 1,000 a year by 2012. To grant all these the charity needs to raise at least £5 million in 2010. The recent event at 125 Ledbury Road, a new retail space in the heart of Notting Hill showcasing independent fashion brands, was one of the smallest events that Camitz Sparkling Vodka have supported. However, it was definitely one of the most high profile in the fashion industry and the street that evening. The current collection being showcased featured Vintage Academe, a luxury vintage retailer, also stocked in Browns, and described in a recent issue of Stella magazine as “An amazing resource for collectors of designer clothes”. The event also celebrated Lauren Adriana’s jewellery designs which are the perfect accompaniment to high end vintage and haute couture. The likes of Paul Smith showed support, which helped add even more sparkle to a wonderful evening where the Camitz Sparkling Vodka complimented all that attended. The story has appeared on some great blogs. 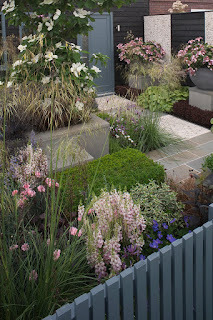 I am so proud that John Woods Nurseries won the RHS Chelsea Flower Show Gold Medal for its Upwardly Mobile garden design and planting, currently on display at stand GPE/10 at the event. The award recognises the development work and creative thinking behind the concept of this innovative front garden feature. The award followed a busy start to the event for John Woods Nurseries after the company played host to a star studded guest list on Monday, the first day of the Show. Dropping in on Upwardly Mobile were thespians, Sarah Lancashire, Dame Helen Mirren and Sir Derek Jacobi, TV presenter Linda Barker and music legend Lulu – who particularly liked the Twist’n’Shout hydrangea. 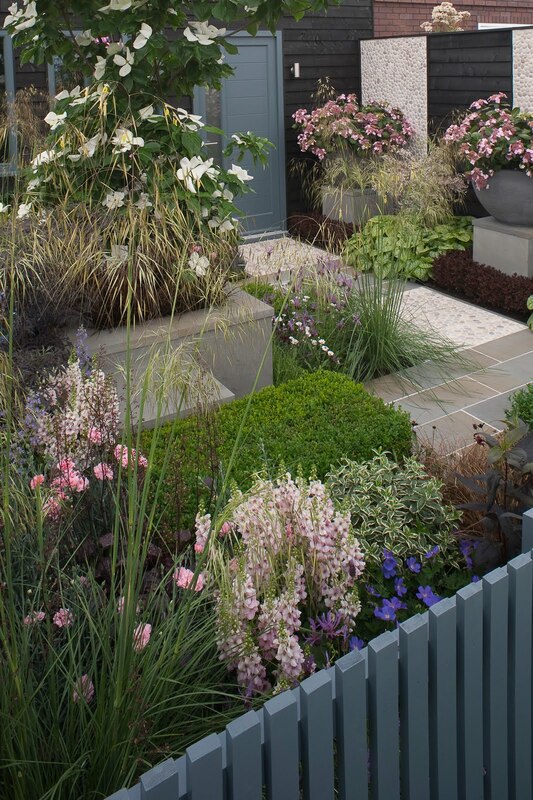 Upwardly Mobile, part of Generation Gardens - a special feature at the show sponsored by The Sun and comprising six front garden designs - is showcasing plants from the company’s Endless Summer and First Editions ranges amongst others. Plot sizes on Generation Gardens are 5m x 5m and are backed by a house front to capture visitors’ imagination. At the end of the show, key elements of Upwardly Mobile will relocate to the National Gardening Centre at Capel Manor College to occupy a larger plot of 11m x 7m. Here key elements will evolve into a family-friendly back garden, supported by the rear facade of a modern contemporary family home. The garden incorporates some great plants from John Woods Nurseries. 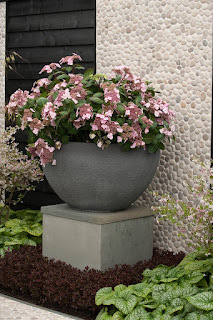 Drawing on the company’s broad range, the designers have made wide use of the Endless Summer range of repeat-flowering Hydrangeas, in particular the new lace-cap Twist ‘n’ Shout. From the First Editions range will be the evergreens, Coprosma Pacific Sunset and the first ever variegated Diervilla, US-developed Cool Splash, showing how to brighten up those dry shady areas. Complementing these is the striking Cornus VenusTM, recognisable by its large creamy-white bracts which appear for up to three weeks from mid to late May. Capel Manor College in Enfield, north London, is the UK’s National Gardening Centre and home to 30 display gardens based on typical urban garden plot size. Every year, some 60,000 people visit Capel Manor College to get new ideas and inspiration for their gardens. Writers, broadcasters and photographers also use Capel Manor College as a reference point. The relocation of Upwardly Mobile to Capel Manor College represents the point when the hypothetical new gardeners decide to move to a larger property and recreate their garden at their new home. The project aims to demonstrate how easy this can be with versatile plants and flexible garden design. Upwardly Mobile will remain at Capel Manor College. I thought that the wonderful time I experienced last Sunday was worthy of talking about. Confirmation was really the next logical step for me. I was at a point in my life when I needed to move my faith forward. I didn’t feel it was quite good enough to just drop into the church now and again and only pray when I remembered. I felt I needed to have a relationship with God and a relationship with those that understood what I was feeling. The whole of my life I have been trying to experience that one moment when God appears. The whole of my life I have had good guidance, my Godmother Ruth Harvey, my parents and family and great mentors such as Mrs Carter from Bath Road Church, The Revd Crossland , The Revd Barraclough and now The Revd Simon Stevenette. I have always tried to live by a good moral code, driven by strong values. It is only now I know why I was doing all this. I was taking a journey to today. Christ Church, the people and my worship there has changed my life. The only way I felt I could demonstrate to everyone that I have arrived in this most important wonderful place, was to be Confirmed and start the rest of my life. I would put down some thoughts about why the colour red is the most awesome colour in the world. The redhead community have a huge group on facebook and the redhead group have been the subject of phone app advertising on TV. I am sure it’s set to increase and grow – you should really get to know a redhead! For most people there is no colour that fires up the imagination and is linked to so many poetic moments as the colour red. Believe it or not, the colour red affects the metabolism, blood pressure, pulse rate and the flow of adrenaline – the colour red keeps us alive. Red is a primary colour that demands quick attention. In western culture red is seen as both a sign of danger, and a sign of love. A “red list” is a list of people and animals etc which are associated with risk and is used as a signal colour in traffic signs and traffic lights. This meaning is perhaps because blood is red and both humans and animals instinctively associate blood with danger. In association with blood and the heart, it also has a positive side, the one of love and commitment. The logo of love and passion - the heart. In design and creative terms, red is a colour that you can combine surprisingly easily with any neutral colour, light beige and gray tones through to chocolate brown and black. But red is also very exciting when you combine it with colours in the spectrum that are close to red such as deep dark purple and orange. Red can also be combined with green blue and gray blues and used as an attention grabber in painting and graphic design. Anyway, whoever has their favourite colour as red, wants variety and adventure, they are often jealous, impulsive, passionate, courageous and enthusiastic. If you deal with someone whose favourite colour is red, you will definitely never be bored. 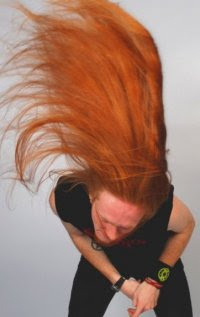 If you deal with someone whose hair is the colour red – expect WOW! What a spectacular launch of the Apple Bottoms AW10 collection last night at No 5 Cavendish Square, London and what a really fashionable way to celebrate Valentines with Camitz Sparkling Vodka. 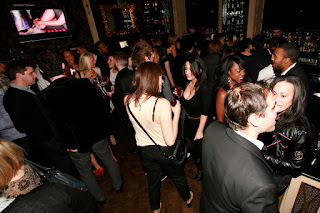 The VIP fashion industry guests and celebs were treated to Camitz Sparkling Vodka throughout the evening and brillant sounds by DJ Sassy Pandez. Sassy is the face of Apple Bottoms and has been described as “Not only the Sexiest DJ in the World, but also the best”. Having DJ’d for Jay Z, Beyonce, Jamie Foxx and Will Smith. With London Fashion Week commencing this week it was certainly the number one event to be seen at. Richard Morris, a good friend of mine, has founded a brilliant organisation Heropreneurs - http://www.heropreneurs.co.uk/ - it's the UK's first social venture fund which supports the British Armed Forces Community (including dependants and spouses of those killed in action) in starting up new exciting enterprises. He is a journalist by trade and has written for a wide variety of print media including the Sunday Times, Wall Street Journal, FT, the New Yorker, Independent and me. 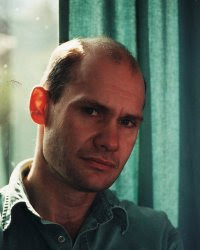 Richard has also held a number of top blue chip roles. We were both discussing today the latest debate over Max Clifford's role in the John Terry saga. We both agree that there is much more to Max Clifford than meets the eye and to refer to him as a PR can sometimes devalue his worth to our international and British media landsape. The impression that footballers are a breed apart was emphatically confirmed by the antics of John Terry last week as it was let out he’d accumulated more female baggage than Louis Vuitton. Now on a par with major entertainment stars, with predictable consequences for their egos, his extramarital affair with the former girlfriend of Wayne Bridge would scarcely be any of our business if it were an aberration. Instead it is just another marked card to chuck on his toppling tower of unwanted publicity. As if things couldn’t get any worse for him, Veronica Parracel had a powerful tool at her disposal: step forward Max Clifford and no-one rises to a challenge quite like him. Such is Max’s influence that when the News of the World won the newspaper of the year award, rivals complained that many of its stories were ‘Clifford jobs’. And barely a Sunday goes by when a newspaper splash doesn't have something to do with Max Clifford, which of course included David Beckham's alleged affair with PA Rebecca Loos and Jude Law's alleged liaison with nanny Daisy Wright. Along with clients including Simon Cowell and Peter Jones, of BBC2's Dragons' Den fame, Clifford says three quarters of his business is "conventional PR", representing property businesses and health and beauty companies. But Max is a much more complex character than just a purveyor of sleaze, as many of his victims have branded him. After bringing up a disabled child - his only daughter Lousie, who has suffered from rheumatoid arthritis since childhood - is also a motivating factor behind many of his decisions. I remember interviewing him for a health magazine some time ago and although he did not criticise the NHS treatment Louise received, he said he had watched with growing anger at what had happened to the health service over the past 20 years. He does a considerable amount of fund-raising for medical charities including media work for a children's hospice at the Royal Marsden Hospital of which he’s a patron. He also handled the publicity for the Daniels family and helped set up the Rhys Daniels Trust which combats Batten’s Disease - a devastating neurological degenerative childhood disease which leads to an early death - usually 3-4 years from its onset. A public relations is at times a risky business but when Max Clifford is involved you can bet that the stakes, whether good or bad, are often high. A great night was had by all of those that attended the Okand event at Zebrano, Soho, London last Thursday and the Camitz Sparkling Vodka went down very well. Brother Snare and the Okand Girls had a great time. Remember that tonight there is another huge event. Go to www.okand.com for info. To everyone who still doesn't know - Camitz Sparkling Vodka helps launch okänd events with a bang tomorrow night, Thursday 28 January 2010. We will be holding the official launch night of up and coming okänd events this year at Zebrano, 18 Greek Street, Soho, London, W1D 4DS with a drinks reception to kick the evening off. 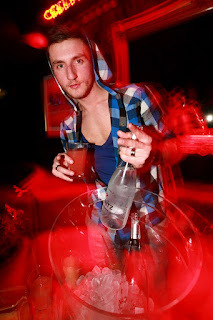 Camitz Sparkling Vodka drinks are set to ensure the night goes with a bang as soon as the bottles are popped at 8pm. From its modest roots five years ago as an underground club scene, okänd has grown into one of the biggest exports from Sweden, taking Scandinavia and Europe by storm. Now, after 12 months of planning, it finally lands on the shores of the UK for its official London launch night in association with Sincura and Jack & Jones. And what a night okänd has in store for you. The doors at Zebrano open at 8pm and, as with all okänd nights, entry will be free all night. A complimentary drinks reception from 8pm-8.30pm will be provided by premium drinks brand, Camitz Sparkling Vodka. Continuously distilled five times, the vodka is then carbonated using a specially filtered gas, documented to be the cleanest of its kind in the world. As the only 40% abv (alcohol by volume) vodka on the market that truly sparkles and pops when opened, Camitz Sparkling Vodka is genuinely unique and is sure to make this night go with a bang. The lovely Swedish okänd girls fly in for the night to host you and give out complimentary membership packs which include VIP cards to all okänd events, the Jack & Jones festival tents (from V festival to Lovebox) and store openings and discounts across London. They will also be giving out a number of free okänd t-shirts. Entertainment will be provided by leading Hed Kandi DJ Charlie Edwards, international getanightlife DJ Simon Speller and live percussion from Ministry of Sound's BrotherSnare. The okänd event is being held at Zebrano, 18 Greek Street, Soho. Dress to impress as we have photographers and press in for the night.